A Crash Course in Horror: Friday the 13th Review | Nerd Much? The plot is simple. An old summer camp is being fixed up by its owner and a group of people in their late teens/early 20’s. Creepy locals warn the young ones that the camp is cursed, but these kids couldn’t care less. This proves to be an unfortunate mistake once the murdering starts. The kids are left with no choice but to try to avoid being killed. I don’t expect a slasher movie to be Shakespeare — heaven knows that Halloween had a dead simple story — but this movie suffers from serious pacing issues. Throughout the entire film, the villain is finding victims and finishing them off. The action can’t escalate because violence is such a regular feature of the film, meaning excitement doesn’t build. Adding to this, all the gaps between murders follow the kids, who are uninteresting and unpleasant in equal measure. These gaps include the kids doing things like repairing gutters, setting up targets at the archery range, or trying to find the coffee creamer. By the end you’re rooting for their deaths, just so you don’t have to watch them do chores anymore. The dialogue in Friday the 13th isn’t engaging, so even the best actors would have struggled; but these actors are not up for the task at all. A pre-Footloose Kevin Bacon and Adrienne King give passable but bland performances. The rest of the cast flounders uselessly. Cheesy, ridiculous line-readings are everywhere. Dying screams are delivered with the enthusiasm of somebody who just rolled out of bed. The villain of the piece is insanely over the top, leaving no scenery unchewed. Is this seriously the best take they had? She’s supposed to be scared for her life, not doing her best Lucy Ricardo impression. There is one aspect to the story that’s worth recognizing: the ending. In all likelihood, this twist is the horror buff equivalent of Darth Vader being Luke Skywalker’s father, but I had NO IDEA it was coming. I wasn’t sure how the film was going to end, but I could never have predicted what happened. That was a stroke of genius which felt otherwise absent from the film’s script. To be honest, there was also an absence of genius behind the scenes. Although some camera tricks (like showing scenes from the killer’s point of view) are used effectively, the cinematography is otherwise lackluster. Cuts between scenes are often abrupt, especially when those scenes involve special effects. Speaking of special effects, those are wildly inconsistent in quality. While a certain character’s death by arrow looks ALARMINGLY realistic, other death effects like a throat slicing and beheading are so obviously staged they completely shock you out of the moment. The beheading looked so silly that I found myself doubled over with laughter at what should have been one of the most tense moments of the film. But nothing looked sillier than that outfit on the left. I see you, the 70’s. This film suffered some production problems in terms of sound. Scenes are dubbed over, too quiet, or otherwise rough. On top of that, the music doesn’t stand out. I don’t say that because it’s bad — to the contrary. Harry Manfredini, the composer for the film, wrote a score that sounds a lot like the work Bernard Hermann did for Hitchcock in films like Psycho. It’s just mixed too low in the film. It wasn’t until I listened to the score on its own that I properly appreciated it. 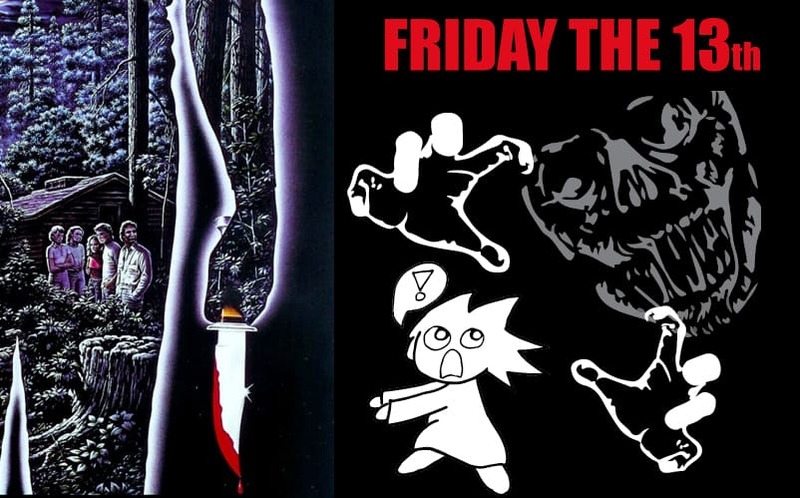 If you’re wondering where that typical “ki-ki-ki ma-ma-ma” (popularly misquoted as “ch-ch-ch ha-ha-ha”) horror movie sound came from — it’s Friday the 13th. So it’s safe to say, by this point, that I didn’t really like Friday the 13th. Considering this is a film that launched one of the most lucrative horror franchises of all time, I was shocked by how mediocre I found it. I know that it holds a special place in many horror fans’ hearts, but after seeing it, I can’t help wondering if that’s a result of nostalgia, rather than actual quality. Having said that, I’ve avoided watching “bad” horror films so far. Maybe my bar has just been raised too high. Buy Friday the 13th here… if you really want to! A Crash Course in Horror updates on every third Saturday of the month. The next update is due on August 20th! If you want to help pick the horror classic I review, just leave a comment below with your suggestion or find me on Twitter (@NoemiPOM)!